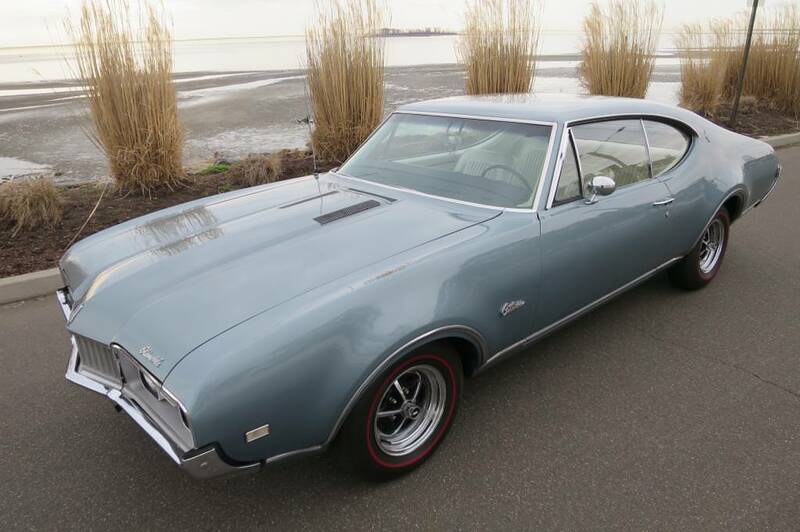 A while back, I purchased a really nice '68 Cutlass Supreme. It's a 44,000 mile Canadian-built car, but it is not a factory color. The OEM color was dark blue. But, I really love the color and it's one reason I bought the car. It's unique. And the repaint was done very well. You would never know it was a different color at one time. Since the car is not correct, I decided to upgrade it to W31 status. The exterior will not change. There will be no badging or anything indicating what lurks under the hood. This will not be a perfectly-correct clone, but a Q-ship. I have a builder that's done some awesome work for me, and he is picking up the car next week. I anticipate it will take him 6 months for the build. I'll try to post some pics as we go along, but he's out of town, so they may be minimal. There will be other items needed to support the build, such as a larger radiator, stall torque converter, etc. We don't know what pistons it has, so once that is determined and an approximate compression ratio determined, we may or may not upgrade the pistons. I want to be able to run it on pump gas. The two items that will not be stealthy will be Vintage Air air conditioning and a complete OAI setup. I love the look of the under-bumper scoops and hoses, so they'll be there for the "cool factor". I'll try to keep this thread updated as much as possible as we go along. I'm curious about your cam selection, amongst other W-31 elements. If you're going with FI wouldn't you want it spec'd to provide the best performance for that combination? Wouldn't the W-31 spec camshaft be more of a hindrance than a boon with that configuration? I'm no expert, just curious. Possibly. I'm not a mechanic, but the builder is very good at that. I want to keep the lope of the W31 cam. I'll mention that to him. Thanks. I love the look of the under-bumper scoops and hoses, so they'll be there for the "cool factor". Indeed, there's no better CAI than the factory OAI. I've been working towards the same essential goal w/ my S. All that I have left to do is rebuild my engine, although I'm aiming a bit higher than a W31 level of performance. Curious on your choice of the 700R4? My understanding is that it has a big ratio drop between 1 & 2 that makes it work better for trucks than cars. I went w/ a 200-4R and selected my rear gear (3.90) based on the OD ratio, the goal being that the overall ratio in 4th be a hair "taller" than what I had originally w/ the Jetaway & 2.78 rear so that my highway mileage be essentially unaffected. Looking forward to seeing how you incorporate that Vintage Air compressor w/ the OAI. I take it that a serpentine setup is out of the question for you? Thanks for the tip. You're not the first one to mention the gear ratio drop in the 700. I talked to my builder and he talked to a transmission guru, and we've decided to use the 200. It will take a few bucks more to beef it up, but it also won't require an adapter to bolt to the block. So maybe a wash on $. The 200 also takes less horsepower to run than the 700. We haven't tackled the issue of the a/c with the OAI hoses yet. My builder is incredible with fabricating (he put a Hemi in my '62 Lincoln), so I don't have any worries. It's just a matter of seeing what fits where. I really don't want to go to serpentine drive, I'd rather keep a stock-ish look. Sounds like some nice upgrades coming for your car. I'm helping my buddy Craig with the same thing on a Canadian '69 holiday that he bought last year(we're going bench seat/4 or 5spd with his). The factory black fender wells already have the dimples in them for drilling the holes for the OAI scoops & also for the two brackets that hold the hoses. I added the whole OAI package from the parts place on my '68. 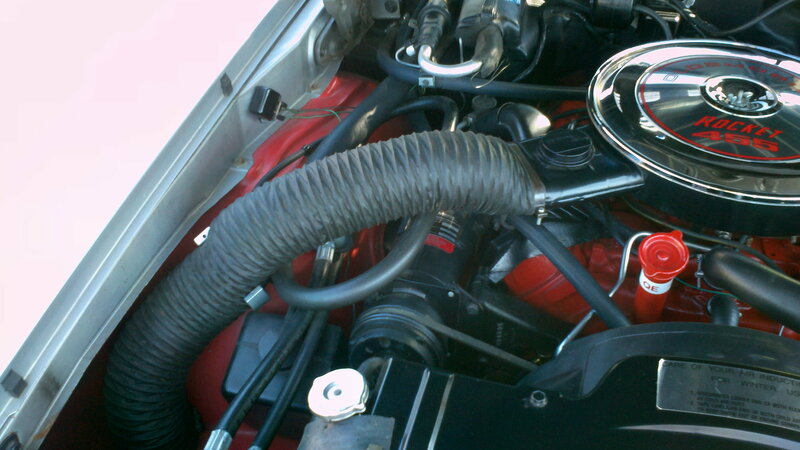 It has factory a/c but I'm running an old Edelbrock O4B intake that's higher than the iron intake so the hose fits over the a/c ok (I did flatten it a bit on the bottom). The parts place & others now have the scoops that are completely assembled,save yourself some headaches & buy them!! You can always add a spacer on top of your throttle body to raise the air cleaner up a bit if needed,there is plenty of room under the hood to raise the air cleaner without hitting the underside of the hood. As far as the exhaust manifolds, there is no such thing as W31 repop manifolds since W31s came with the same exhaust manifolds as any 350, Olds just used the block-off plate on the pass. side. Are you looking at Thorntons 350jr manifolds? Those look pretty good but they recently came out with some nice looking shorty header style small block manifolds that look really nice! They look way better than the ones they came out with for the big blocks a while back. We're considering them for Craig's build. Thanks for the info. It's nice to know that the a/c and OAI hoses can play nice. I think with the aftermarket a/c setup we'll have a bit more room under the hood as compared to the OEM setup. I was looking at high-performance exhaust manifolds from Supercars Unlimited, and mistakenly referred to them as W31 manifolds. I had one set of headers in my life and vowed to never do that again. The problem with A/C and the 68-69 OAI setup isn't just the hose. On the 1968 H/Os with A/C, the RH snorkel and hot air adapter has the crap beaten out of it on the underside to clear the compressor bracket. The narrower SBO makes that worse. A Sanden may preclude the need for this, but I don't know. And, there is no such thing as "high performance small block manifolds". The aftermarket ones have no more internal flow area than do stockers. Part of the build entails a disc brake conversion for the front, which requires 15" wheels. I bought a conversion kit from Inline Tube at MCACN last year and started shopping for repro 15" SS1 wheels. After a couple of false starts with vendors who couldn't produce, I decided to go straight to the source and order them from Wheel Vintiques. That was in February. They FINALLY arrived last Friday. Unbelievable. So, the builder is picking the car up on Wednesday and we're off to the races. Part of the build entails a disc brake conversion for the front, which requires 15" wheels. Not if you replicate the factory setup using GM spindles, calipers, rotors, etc. It was easier buying the conversion kit rather than trying to source the GM components individually. Plus, the kit was on sale. I also went with staggered 15" wheels, 7" in front and 8" in the rear. If this conversion kit uses stock type spindles, 10.75" rotors, and stock type single piston calipers with 2.75" pistons, it is exactly the same as the factory hardware that came with 14" wheels. 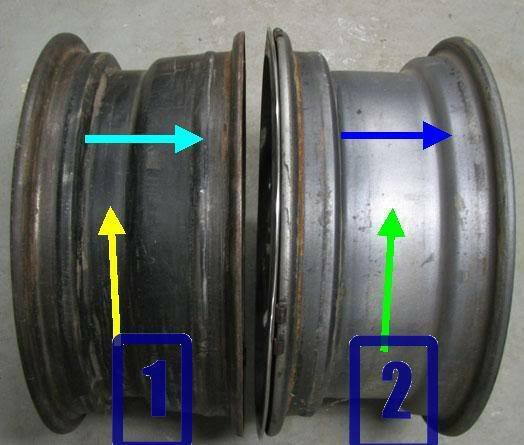 I've spoken to several disk brake kit vendors about this, and the response I always get is that it is easier to tell the customers to use 15" wheels than to try to educate them about the differences in 14" wheels. Disk brake 14" wheel on the left, drum-only on the right. Either go with the Thornton 350 manifolds or their new Stainless shorty headers, thick 3/8" flanges and bolt on to stock exhaust outlets. My Sanderson shorties are similar, only need tightened once in a while at the motor and I went with aluminum collector gaskets, the Thornton header eliminates collector gaskets all together, pus they are stainless. Good call on the 2004R, I have ran both behind an Olds 350, the 2004R has near ideal gearing. Unfortunately both are weak stock, make sure it has enough mods including a deep pan and bottom feed filter. I would seriously consider the extra expensive of a roller cam or at least a more modern flat tappet. Cutlassefi does custom grinds and he also brought new 10cc dish, modern forged pistons from Mahle that will give ideal low to mid 9's compression. Also being a Canadian car, it should have the 12 bolt chevy rear, more ratios and cheaper parts. According to the experts, the factory axles shafts are very weak, they neck down and should be changed, even with a mild build. Nice car, I like the colour also. Well, I'm beginning to see the light at the end of the tunnel. It's been a long process. We still have the interior to do, and hopefully that will start in a week or two. That's the last piece of the puzzle. 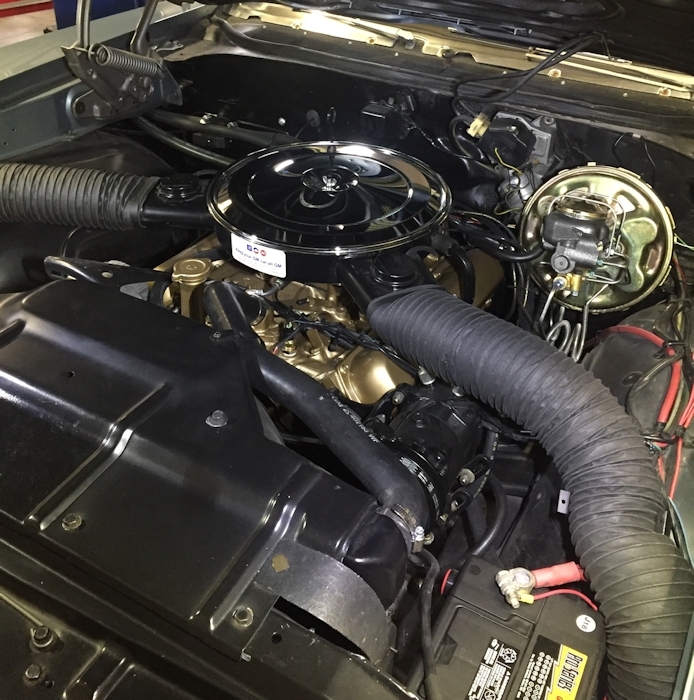 The engine has been built close to W-31 specs (primarily with heads and cam), we replaced the carb with fuel injection, the slushbox has been replaced with a 4-speed auto, anti-spin and some better gears have been installed in the rear end, and we added aftermarket air conditioning. We also added a repro OAI setup. Here's a teaser pic the builder sent me, and you can see the aftermarket a/c compressor on the left side of the engine. We tried to hide it as best we could. Nice job. Love that car, love the color. That W31 OAI set up is sweet. what fuel injection system did you use? He uses FiTech. I have that on my '79 Mark V and it works perfectly. Do you have 4 wheel disc on your car? I was wondering because of the master cylinder. My compliments on the project. I really like the Supremes, since you get so used to seeing the Cutlass/4-4-2 trim. It is nice for a change. There was an authentic 1968 Supreme with the W-31 package in the old BOP mag. It was red/black. Very rare. I built a 1973 W-31 based on a Supreme. One of the things I did to make it authentic was convert from power brakes to manual. I think it is superior for feel and there is no effort issue at all. Please keep the eye candy posted. best way to ship bucket seats? How to ship an engine block? ?